Since the Pie update for Galaxy S9 and S9+ leaked a few days back, we have seen several ports from the Experience 10 UI. We already posted the Experience 10 launcher APK, and now, we have more stuff from the XDA developer community. 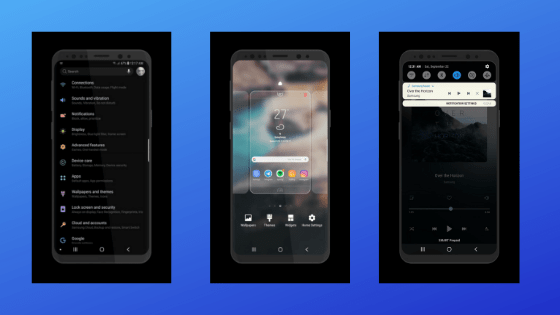 XDA Recognized Themer envy had ported Night theme from the Samsung’s new Pie based Experience 10 UI. This Night Theme comes with more than 150 custom 3rd party icons, which will give an exact stock look of Samsung’s Android 9 Pie based ROM. This is a perfect dark black theme, which looks stunning in a black AMOLED background with less white bubbles. Once you apply this theme, you will see multi-colored applications in the app drawer, because all the icons are unique and colorful. You can download Night Theme APK based on Samsung Experience 10 UI from the link given below. You don’t need to have root access in order to use this theme. All you need to do is download the file, and install it like a normal APK. We have a tutorial for that too. Read ahead. Although Samsung has not released an official build of Android Pie, this Night Theme port is quite stable. The theme is optimized mainly for Android 8.0 Oreo-based devices like Galaxy S8, S9, and S9+. However, some Nougat based devices also support this theme. In that case, you may face some minor bugs. The developer has released different versions of Night Themes, based on different style, UI, color, etc. Download from the below links as per your choice. Make sure to install only one theme at a time. Also, make sure that you are on the default theme first. If any third party theme is already installed, please do uninstall it. Otherwise, multiple theme may cause issues. At first, download Night theme APK file on your PC. Next, tap on the “<Night-Theme-file-name>.apk” file. Now, you must follow the on-screen instructions and install Experience 10 Night Theme App with icon packs. That’s all! You can now enjoy the pure stock experience of Samsung’s new Experience 10 PIE based UI on your phone. What’re your views on Samsung Night Theme? Do you like it? Is that working on your device correctly? Which phone are you using? Do let us know by commenting below! Links are already given in the download section. Please read the entire post once again!